My first purchase on etsy arrived yesterday! It was so exciting to be collecting mail from the post office and not only sending. I was like a little girl with a packet of sweets – didn’t manage to get to the car before opening the envelope to see these gorgeous business card holders neatly packaged at the bottom. Love them! 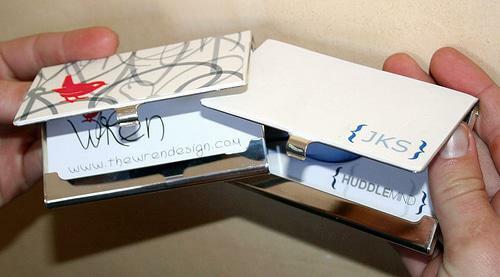 These business card holders were custom made by Mydesigncollectables. This entry was posted in Blog and tagged Business card holders, custom order, etsy buy. I’m honored, thank you. It was a pleasure making the business card cases for you and I am happy that you are pleased with them. How fun. They look great. No wonder you had to open them up before you even got to the car. Oh yes,thatÂ´s looks very good and a great idea for your business cards! Those are lovely, I couldn’t see anything about them on her etsy shop, do you have any more information about them, such as materials used, prices?